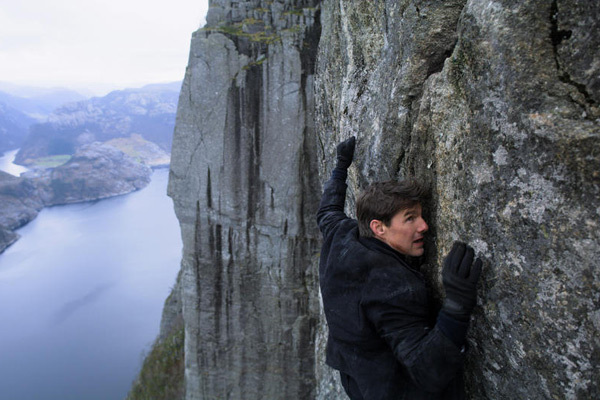 Paramount's action film Mission: Impossible-Fallout continued to lead North American box office with an estimated $35 million in takings for the second weekend in a row. The film, starring Tom Cruise as Ethan Hunt, is the sixth installment in the franchise. The movie, directed by Christopher McQuarrie, also stars Ving Rhames, Simon Pegg, Rebecca Ferguson, Sean Harris, Michelle Monaghan and Alec Baldwin, all of whom reprise their roles from previous films. McQuarrie is the first director to helm two films in the franchise. The film brought in $124.5 million in North American theaters by Sunday, according to studio figures collected by comScore. Falling short of expectations, Disney's fantasy comedy film Christopher Robin opened in second place with an estimated $25 million. Directed by Marc Forster, the film is inspired by A. A. Milne and E. H. Shepard's book Winnie-the-Pooh. It's a live-action extension of the Disney franchise of the same name. The plot follows Christopher Robin as he grows up and loses his sense of imagination, only to be reunited with his old stuffed bear friend Winnie-the-Pooh. Christopher Robin received a positive review with a strong "A" rating from moviegoers on CinemaScore. But it only received a 68 percent certified fresh rating on Rotten Tomatoes. Families made up 60 percent of moviegoers. Another newcomer, Lionsgate's action comedy film The Spy Who Dumped Me opened in third place with an estimated $12.35 million in its debut weekend. Directed by Susanna Fogel, the film follows two 30-year-old best friends who are thrust unexpectedly into an international conspiracy and get chased through Europe by assassins after one of their ex-boyfriends turns out to be a spy. Universal's musical romantic comedy film Mamma Mia! Here We Go Again came in fourth with an estimated $9.09 million in its third weekend. The female-led film is a follow-up to 2008's Mamma Mia! which was based on a musical of the same name. It earned $91.33 million in North America through Sunday. Starring Denzel Washington, Sony's action movie The Equalizer 2 finished fifth with an estimated $8.83 million in its third weekend.